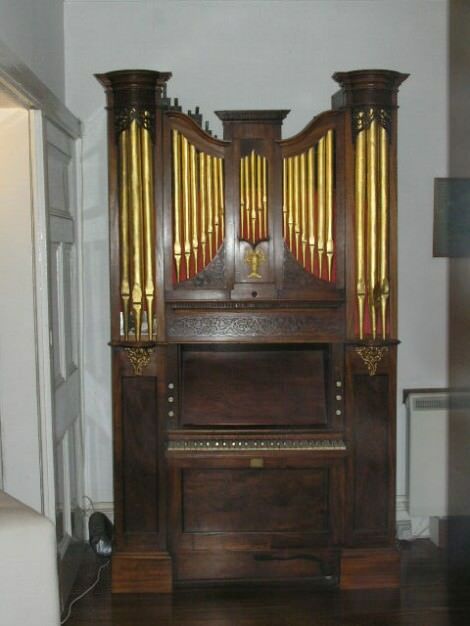 The organ was purchased in 1975 by Dr. Peter Caudle from the Royal School of Church Music at Addington Palace, Croydon in 1975(?). Its earlier owners are not known. For many years the organ had been unplayable. The GG key is stamped ‘3 1777’, which is a plausible date for the organ. It was presumably made by a builder of the second rank for a middle class drawing room, though with an entrancing miniature church organ case. The physical evidence suggests the Georgian organbuilder used an earlier windchest and some of its wooden pipes (c.1680-1700) within a new case and with a new mechanism. A brass plate reads: Coleman & Willis/Organ Builders/29 Minories London. This suggests a date before 1866 for Coleman & Willis’ work, which included (from the physical evidence): converting the former wedge bellows to a parallel rise bellows, reconstructing the internal framework, and supplying the ‘inside’ metal pipes. A further brass plate reads: “In thankfulness to God for the memory of/Peter Mawe Greany, late I.C.S./This organ was restored by his widow, Grace/1957/ KHUDA HAFIZ” (This is a common parting phrase in Iran and the Indian subcontinent, with the meaning ‘may God be your guardian’). It is not obvious what work was carried out at this restoration. Key compass: GG AA C D – e³ (C – e³ from ca1850). We made new pipes for Stop Diapason AA, Principal GG and Twelfth GG and lengthened Stop Diapason GG, Principal AA and Twelfth AA. The pitch is about a¹=440Hz, derived from the front pipes after taping up the tuning slots to the original level. The tuning is now Kellner-Bach.